Paverscape Inc. has been installing all phases of hardscape and landscape projects in the commercial field for over 20 years. Our resume includes anything form Large scale Paver Parking lots, to roadways, sidewalks, intersections, large or small retaining walls, landscaping, Permeable Pavers, and even boulders. Our commercial Cliental consists of Hospital entrance ways, to city streets, and even small walkways at local vendors and restaurants. We can build to suit your business at competitive rates. 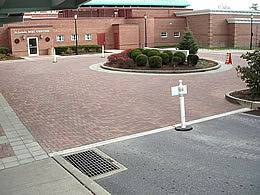 When St. Luke's Hospital in Quakertown needed to replace their 10,000 square foot entrance way, they chose Paverscape Inc.
With the hospital in full operation, the old and failing entrance way had to be replaced in a professional and timely manner. The project had to be done in phases to accommodate constant pedestrian traffic, ambulances, and other vehicular traffic. 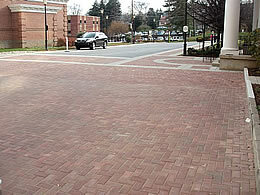 We used a custom ordered 4" thick paver. This will provide extra support for all of the daily traffic and remain beautiful, withstanding years of constant wear. All water flow was directed into existing drains, and the base preparation was constructed to exceed all industry standards for compaction and installation procedures. 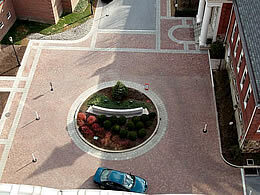 Paverscape completed the project ahead of their deadline and exceeded all of their expectations.